The Secretary of State for Economy and Business Support, Ana de la Cueva, met today at the Residence of the Ambassador of Spain, with the Ambassador, Santiago Cabanas, representatives of the main Spanish companies, and members of the Embassy. The US Spain Executives Community had the honor of participating through its President, Gonzalo García. The Secretary of State had the opportunity to learn first-hand about the opportunities and difficulties identified by Spanish companies operating in the US. March 2019 newsletter, which includes an interview with the founders of Moonshot (an innovation ecosystems management platform), a blog article on US benefits by Kira Rubiano from Auxadi, as well as information on events, funding opportunities and recent news related to our community. Moonshot Innovation is a Spanish startup that has created moonshot.ceo, the first platform for the CIO and the C-Level to manage Innovation Ecosystems as proprietary environments. The Co-founders are Carlos Marquerie (on the left in the picture), with an extensive experience in consultancy and innovation processes, and David Suriol (on the right), a serial entrepreneur. 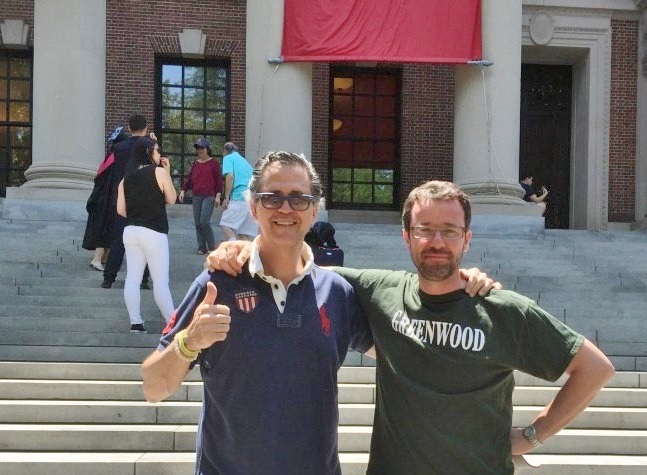 Carlos and David met in Boston in 2015, while they were studying at Harvard Extension School. They started Moonshot at the end of 2017 and now they are launching the first ecosystems through the platform. Moonshot is planning to land in United States before the summer. InnoSky had a unique opportunity to interview Carlos and David to learn about Moonshot and innovation ecosystems management. Read the full interview. February 2019 newsletter, which includes information about the Farragut award delivered to Jose Andres as well as links to a few articles and news that should be of interest for our community. Over 80 Graduate Students from UPM Best Schools of Engineering are looking forward to being part of the most advanced organizations and to expand the knowledge acquired as students in the US. This includes engineers from diverse backgrounds: Aerospace, Mechanical, Construction, Industrial Operations, Data Science, Computer Science, Electrical, Biotechnology, and more.